For other uses, see Get Up, Stand Up (disambiguation). (1973) "Get Up, Stand Up"
(1973) "I Shot the Sheriff"
"Get Up, Stand Up" is a song written by Bob Marley and Peter Tosh. It originally appeared on The Wailers' 1973 album Burnin'. It was recorded and played live in numerous versions by The Wailers and Bob Marley and the Wailers, along with solo versions by Peter Tosh and Bunny Wailer. It was later included on the compilations Legend and Rebel Music, as well as live recordings such as Live at the Roxy among others. 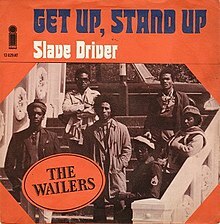 In 1973, "Get Up, Stand Up" peaked at number 33 on the Dutch Top 40. In 1986, it peaked at number 49 in New Zealand. Marley wrote the song while touring Haiti, deeply moved by its poverty and the lives of Haitians, according to his then-girlfriend Esther Anderson. The song was frequently performed at Marley's concerts, often as the last song. "Get Up, Stand Up" was also the last song Marley ever performed on stage, on 23 September 1980 at the Stanley Theater, now the Benedum Center in Pittsburgh, Pennsylvania. On his DVD Live at the Hollywood Bowl, artist Ben Harper relates a childhood experience in which, during a 1978 Bob Marley concert at the Starlight Amphitheater, Peter Tosh showed up unannounced as this song was being performed, took the microphone from Marley and started singing the last verse of the song to thunderous applause. Tosh was on tour opening for the Rolling Stones at the time. The song was re-recorded and re-released by the three major Wailers on their own solo releases, each with varying arrangements and approaches to the third verse, which claims that "Almighty God is a living man". Bob Marley and the Wailers released a Bob Marley only version on Live! in 1975, this version was notable for the "WO-YO!" refrain after the third verse. Tosh would include his own solo version on his second album, Equal Rights in 1977. Bunny Wailer was the last to release his own version on Protest. This version actually featured Tosh due to his involvement in recording the album before his death. In 1988, the song was performed live at an Amnesty International Concert for Human Rights by Bruce Springsteen, Sting, Peter Gabriel, Tracy Chapman and Youssou N'Dour. The 2014 album Songs from a Stolen Spring features a version of the song performed by Glenn Tilbrook of Squeeze fame. The version is meshed with "Beyond These Doors" by Egyptian singer Dina El Wedidi. The Ukrainian band Bloom Twins recorded a version in 2014, in support of the Euromaidan protesters occupying Independence Square in Kiev. ^ "The Wailers – Get Up, Stand Up". Dutch Top 40. Retrieved 4 July 2013. ^ "charts.org.nz – The Wailers – Get Up Stand Up". Charts.org.nz. Hung Medien. Retrieved 28 May 2014. ^ Genegabus, Jason (20 October 2011). "HIFF Review: 'Bob Marley: Making of a Legend'". Honolulu Star-Advertiser. Retrieved 7 January 2014. ^ Devenish, Colin (11 December 1998). "Springsteen Joins Superstar Lineup At Amnesty Gig". MTV News. Viacom. Retrieved 27 July 2015. ^ O'Connor, Roisin (15 June 2016). "New music to listen to this week: Bloom Twins". The Independent. Retrieved 29 September 2016. Recording history of Get Up, Stand Up at The 60's Jamaican Music Reference.